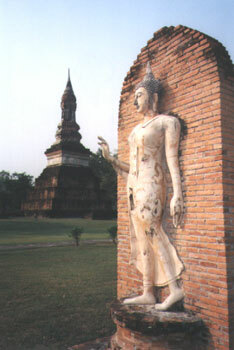 A walking Buddha, unique to the Sukhothai style of sculpture. This asana (posture) is said to symbolize Buddha's walking down from Tavatisma Heaven after he had visited his mother. Alternately, it has been interpreted as Buddha moving foward to offer the world his teachings. Buddha images are made in one of four asanas -- walking, standing, sitting, reclining -- each with a distinctive mudra, or hand position.